Display your home decor or books with the options of the 72-Inch open executive bookcase. Five shelves are ideal a multitude of display options, while a traditional design features bracket feet and a deep chocolate finish. 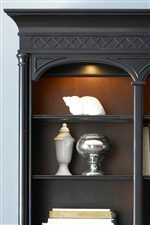 The St. Ives Traditional 72-Inch Executive Open Bookcase by Liberty Furniture at Novello Home Furnishings in the Berlin, Barre, Montpelier, VT area. Product availability may vary. Contact us for the most current availability on this product.